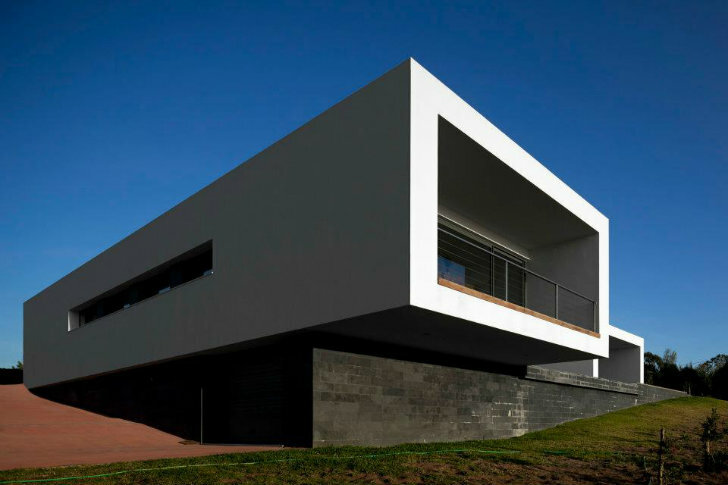 The U House is pro surfer José Gregório's modern, sustainable residence situated on top of a hill overlooking the Saint Lorenzo Bay in Ericeira. 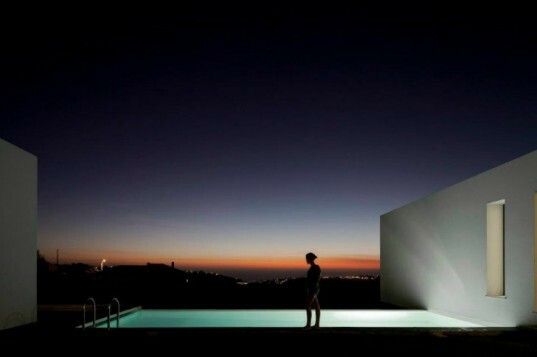 As the name implies, the house is shaped like a U with a protected courtyard and pool in the middle. Designed by Jorge Graça Costa, the home's implicit sustainability avoids big pronouncements and focuses on the interweaving of good design and environmentally friendly strategies. Orientation and the home's envelope are the first lines of defense against energy loss, while eco-friendly materials, solar panels and rainwater harvesting round out the home's green features. The U House is sited to protect itself from the prevailing winds – from the north in the winter and from the south in the summer. The home opens up to views in the west and creates a protected courtyard in the middle. The north wing contains three bedrooms, a bath plus the master suite, while the south wing contains the open floor plan living, dining and kitchen. Plenty of glazing with deep setbacks provide natural daylighting without overheating the interior. The home’s envelope is efficient with lots of insulation to minimize energy losses. Inside, eco-friendly materials like cork are naturally incorporated into the home’s design and artwork made from recycled materials is featured prominently within the home. Solar thermal panels on the roof provide domestic hot water and support radiant floor heating, which is supplemented by biomass heating when necessary. The pool, which is treated without any chemicals, creates a cooler microclimate in the courtyard and rainwater is harvested and stored in a tank for landscape irrigation. The 300 sq m (3230 sq ft) home’s sustainability and design are balanced successfully to create a livable and comfortable high-performance home. The U House is sited to protect itself from the prevailing winds - from the north in the winter and from the south in the summer. The U-shape opens up to the views in the west and creates a protected courtyard in the middle. The north wing contains three bedrooms, a bath plus the master suite, while the south wing contains the open floor plan living, dining and kitchen. Plenty of glazing with deep setbacks provide natural daylighting without overheating the interior. The home's envelope is efficient with lots of insulation to minimize energy losses. Inside, eco friendly materials like cork are naturally incorporated into the home's design and artwork made from recycled materials are featured prominently within the home. Solar thermal panels on the roof provide domestic hot water and support radiant floor heating, which is supplemented by biomass heating when necessary. The pool, which is treated without any chemicals, creates a cooler microclimate in the courtyard. Rainwater is harvested and stored in a tank for landscape irrigation. The 300 sq m (3230 sq ft) home's sustainability and design are balanced successfully to create a livable and comfortable high-performance home. Deep overhangs on a patio off the living room provide shade to the interior while still allowing daylight to enter. The open floor plan living area. The hallway next to the private bedrooms.